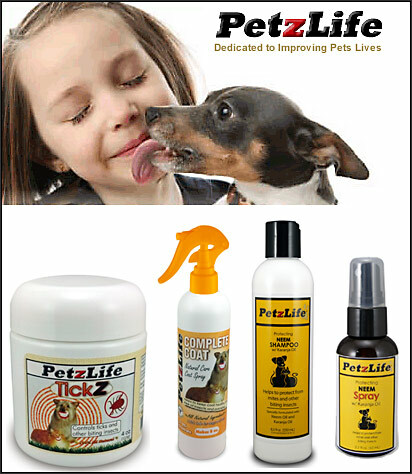 Flea products by PetzLife Products Inc.
Don't use toxic chemicals to keep the bugs at bay when you can use the safe and effective line of products from PetzLife! "Be concerned if any pet product has the statement, Not for human consumption,"
PetzLife Complete Coat is formulated as a topical formula to keep your pet’s coat healthy and, more importantly, to ward off insects and parasites of all types. It is all-natural and contains NO pesticides. TickZ is an herbal product that helps to repel Ticks and other biting insects. Does not contain any chemical insecticides and is safe for all ages. Ideal for dogs or owners who are allergic to chemical sprays. Simply sprinkle on the animal’s moist food twice a day for 5 days and protect your pet for up to 2-3 months. Takes effect in as little as 5-10 days and dosage can be repeated if needed. Ingreidents: Larrea mexicana, Syzigium (Chapparel Leaf) Aromatica, Berberis aquifolium (Oregon Grape Root) Quassia amara, Picrasma (Quassia) Excels Tanacetum vulgare (Tansy) Urtica capitata,Thymus (Thyme) Vulgarus. The main ingredient is the Quassia tree bark that comes from South America. Every tree that surrounds the quassia has insects and bugs all over them, this particular tree does not have a single one. TickZ is an herbal product that helps to repel Ticks and other biting insects. Does not contain any chemical insecticides and is safe for all ages. Ideal for dogs or owners who are allergic to chemical sprays. Simply sprinkle on the animal’s moist food twice a day for 5 days and protect your pet for up to 2-3 months. Now for the first time the miraculous healing power of Neem and Karanja Oil has been added to the most luxurious pet shampoo combining with a unique blend of natural botanical extracts of Rosemary, & Green Tea, Vitamin E, Biotin, Vitamin B5, Shea Butter, Honey & essential oils. Mild tear-free concentrated formula helps to alleviate difficult skin irritations such as heat rash, hot spots, abrasions and scaly skin. Now experience the healing power of Neem and Karanja Oil - benefit by protecting from mites and other biting insects as well as healing the bite. What Are The Benefits of Neem and Karanja Oil? Neem and Karanja Oil - benefit by protecting from Fleas, Ticks, Mites and other biting insects as well as healing the bite with its natural healing powers. Neem Oil has been used for centuries to protect animals and humans from irritation from insects and flies in a natural non-toxic way. Neem oil for dogs and cats can help with flying insects, biting insects, and mange mites. Perfectly safe for pet skin and fur. Promotes healthy skin and lustrous, problem free coat. How Does Neemz Spray and Neems Drops Work? How Do Mites Affect My Dog's Coat and How Do I Know If I Have Them? Fur mites, otherwise known as Cheyletiella mites are larger than most other mites affecting dogs, and can actually be seen by the naked eye if you look closely enough. These mites can cause Cheyletiella mange which is characterized by skin irritation, hair loss, itching, and dandruff. In fact, the condition is often referred to as "walking dandruff" as the mites move around under the scales and skin flakes on your pet giving the impression of moving dandruff. Fur mites can live in the environment without a host for up to 10 days and so it is fairly common for bedding and carpeting to become contaminated if your canine has fur mites. In addition, fur mites can also temporarily affect humans causing itchiness and skin irritation, and even painful skin lesions in severe cases. For mites can often be detected by the naked eye if you look closely enough, however, they are still quite small and a magnifying glass is often necessary. Your vet will probably examine your pet’s skin and fur with a magnifying glass; do skin scrapings, or combings to detect the fur mites and their eggs. Order Your PetzLife Flea and Tick Products Today! PetzLife products can be purchased at PetsMart, Petco, VitaCost.com, Amazon.com, Revival Animal Health and many fine retailers. You are also welcome to purchase at petzlife.com.